Welcome to the March Pubwatch for BOOM! Studios. This is my first month writing the BOOM! Pubwatch but you may remember me (Christa) from the IDW Pubwatch. I really enjoyed my time writing about IDW comics and in particular expanding my knowledge of the Teenage Mutant Ninja Turtles universe, and now I am excited to dive into the wide world of BOOM! comics as well. 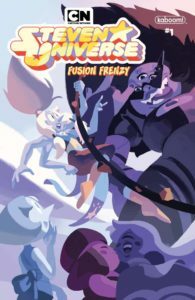 Especially since they publish some of my favourite comics, like Lumberjanes, Steven Universe and Goldie Vance. Between BOOM! Studios, BOOM! Box, KaBOOM!, and Archaia there will be plenty to talk about each month. So without further ado, let’s get started! WonderCon is coming up at the end of this month and if you’re lucky enough to be attending, there are two great BOOM! panels to check out. On Saturday, March 30th you can attend “BOOM! Studios: Discover Yours at WonderCon” and learn all about some fantastic new and upcoming series. 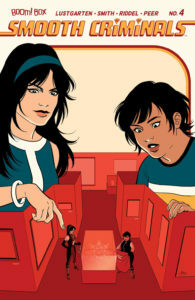 The panel will include Ryan Parrott (Mighty Morphin Power Rangers), Lilah Sturges (The Magicians: Alice’s Story), C.B. Lee (Ben 10™), Carly Usdin (The Avant-Guards), Delilah S. Dawson (Sparrowhawk), Sina Grace and Matt Gagnon (Editor-In-Chief, BOOM! Studios) and will be starting at 11:00 am in Room 207. And for all my fellow Lumberjanes fans out there, on Sunday, March 31st you can celebrate the five year anniversary of the series with the “Lumberjanes: Celebrating Five Years of Friendship” panel. Co-creator Shannon Watters, writer Kat Leyh, writer Lilah Sturges, and Executive Editor Jeanine Schaefer will be in attendance and there will be an exclusive giveaway for all attendees. Check it out at 11:00 am in Room 211. Find out more about BOOM! at WonderCon here. 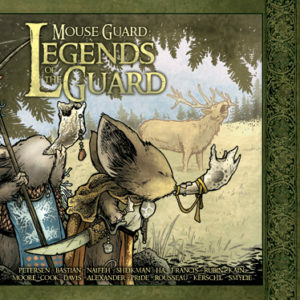 Mouse Guard, the popular comics series featuring a medieval order of mice who are the sworn protectors of their realm, is coming to the big screen and has recently found its stars! The movie, directed by Wes Ball (The Maze Runner), will star Andy Serkis (Lord of the Rings) as the villain, Midnight, the Guard’s blacksmith who turns against them. And Thomas Brodie-Sangster (Love Actually) will play Lieam, one of the Guard’s newest and youngest members. Production for the film is due to begin in June, which means you’ll have lots of time to read (or reread) the series before it hits theatres. 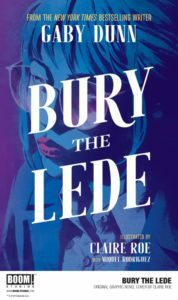 New York Times bestselling author, Gaby Dunn (Bad with Money, I Hate Everyone But You) is joining forces with artist, Claire Roe, to make her comics debut with Bury the Lede. The original graphic novel is about twenty-one-year-old Madison T. Jackson, who has recently taken a night internship at The Boston Lede. For the most part, the job is grunt work, fetching coffee and doing whatever the senior reporters demand. But everything changes when a prominent Boston businessman is murdered and Madison heads to check out the gruesome crime scene. There she meets socialite Dahlia Kennedy who is being arrested for the murder of her family and she heads down a dark and dangerous path she never expected. I’ve really enjoyed Dunn’s writing and her podcast, Bad With Money with Gaby Dunn, so I’m excited to see what she can do in this new medium. Especially when I found out Bury the Lede is inspired by Dunn’s own experiences as a reporter with The Boston Globe. The comic will hit shelves this October but you can check out a sneak peek now. Pirates have infiltrated the Candy Kingdom and stolen one of Princess Bubblegum’s prized possessions. Since the Candy Kingdom has no navy (sugar dissolves in water) she calls upon her good friend Marceline to retrieve it. With BMO, and his sonar abilities, by her side, Marceline embraces the Pirate Queen life and sets off on the dangerous quest to retrieve the treasure and save the day. 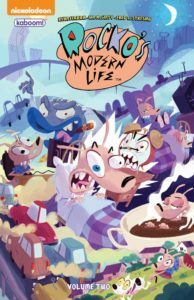 Marceline and BMO are easily two of my favourite Adventure Time characters, so I loved getting swept up in this stand-alone adventure with the two of them. The humour was perfect, and the pacing of the story was consistent, and there was always something new around the corner. Being Marceline, she faced every challenge head-on in her own unique way. 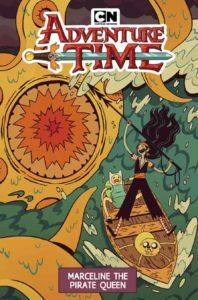 Overall, this is a fun, quick read that would be enjoyable for long-time Adventure Time fans, or those dipping their toes in for the first time. I read and fell in love with Carly Usdin’s Heavy Vinyl last year. A comic about a group of teen girls who work in a record shop by day and are a vigilante fight club by night was too good a premise to pass up. So when I found out she was writing a new series I knew I had to check it out. 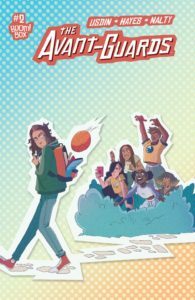 The Avant-Guards is the story of a group of girls trying to get a basketball team going at their college, the Georgia O’Keefe College of Arts and Subtle Dramatics. They just need one more member and they’re hoping that member will be the new transfer student, Charlie. The previous issue of this series introduced us to the major players and in this issue, we get a chance to see them interact one-on-one with Charlie as they try and convince her to join the team. When there is such a large group of characters in a comic like this, I often find it difficult to get a sense of each of their personalities. There’s always a few characters that fade into the background. But the way this issue is organized you get some insights into all the characters and their unique personalities. They also look really unique. It’s obvious that the creative team really took their time with the character design. There are so many great little details throughout. If the team can keep this balance going this could be a really strong ensemble comic. At this early stage, I’m not sure I’ll love this as much as Heavy Vinyl (because really how do you top teen vigilante fight club?) but am confident that this will, at the very least, be another well written, funny and diverse comic from Usdin. I’m looking forward to finding out what Charlie and her new teammates get up to next. 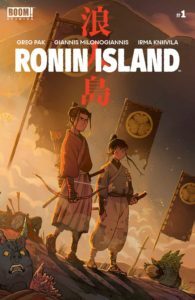 In this new series, a mysterious attack has wiped out the major cities of 19th century Japan, Korea and China, and a group of survivors have gathered together on a small island and are building a new society together. Two of these survivors are Hana, an orphaned Korean peasant, and Kenichi the son a samurai leader. They don’t care much for one another, but the rest of the island residents are counting on them. So when new dangers threaten their way of life—first an army sent by the new Shogun, and then a mutated horde intent on destruction—they’ll need to work together to figure out how they’re going to survive. This is an action-packed comic that wastes no time getting into the heart of the story, no filler or extended pages of exposition here. But what really won me over in this first issue was Milonogiannis’ gorgeous artwork. The character’s faces are just so expressive, and each panel is rich in detail. I’m looking forward to seeing how this story unfolds and how this comic will tackle the important and difficult themes of community, responsibility and cultural conflict. That’s it for my first BOOM! Pubwatch! I hope you’ll check out some of the featured comics if you haven’t already and let me know which BOOM! comics you’ve read and enjoyed this month too.